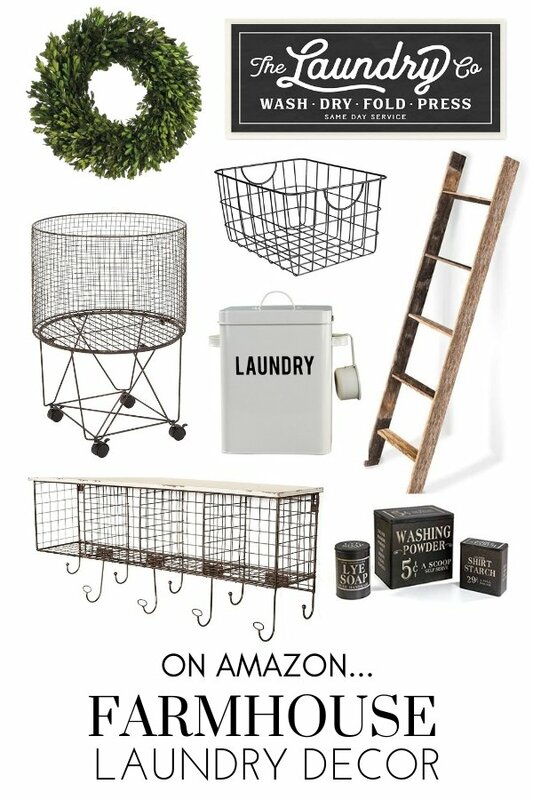 Simple and adorable Farmhouse Laundry Room Decor that you can find on Amazon! I am totally addicted to Amazon. It’s true! I love that I can find anything and everything and most of the time, it’s Amazon Prime, which means free 2-day shipping. So when I can even find some of the cutest farmhouse laundry room decor (and farmhouse decor for any room or space) and it will show up on my doorstep, that’s a huge win! I put together a collection of some of the cutest simple and adorable decor that’s perfect for any farmhouse laundry room, and all of it you can find on Amazon! I love a simple, clean look the best–wire baskets, a bit of wood accents, black and white decor, and greenery for a pop of color. How adorable is a wooden ladder hung from the ceiling, used to hang drying laundry? A rolling laundry cart is the cutest thing ever, but also super functional. Boxwood wreaths are my favorite go-to wreath, and are quintessential farmhouse style. I have farmhouse shelves in my laundry room that are perfect for holding glass jars full of clothespins, laundry detergent and dryer sheets. Wire baskets with crisp white towels are another favorite item for shelves, or even on top of the washer or dryer. Get the latest in farmhouse style, home decor, DIY, organization, holiday ideas, and more! Join my newsletter…delivered right to your inbox!